Find the best mascara for sensitive eyes, affordable, organic, chemical free and not made through cruelty to animals. I don't wear a lot of make up, mainly as I do a lot of sport and mascara and eye liner just doesn't gel with sweat and my contact lenses! But I do apply a little eye shadow, eye liner and mascara when going out in the evening. The problem with mascara is that it can often flake and the tiny particles are SO irritating if you wear contact lenses! In the past I've used expensive brands of mascara like Lancôme as they were the only ones I could find that were kind to contact lenses and didn't flake and, to be honest, I'm too lazy to go hunting for new cosmetics when I hardly ever wear make up anyway. But now I'm older, I'm keen to use only GREEN, natural and ORGANIC products and there are plenty to choose from, aside from the expensive big brands which are pretty much a rip-off anyway. I found this mascara for sensitive eyes in my local pharmacist. It caught my eye as I really liked the packaging but realized it was also an eco-friendly product too! 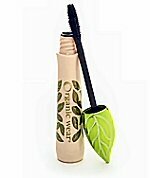 Organic Wear 100% Natural Mascara	is perfect for contact lens wearers and those with light sensitive eyes. It is 100% free from horrible chemicals, synthetic preservatives, GMO's (genetically modified organisms), synthetic fragrances and colors and no animal has suffered in a laboratory just so you can look beautiful! This great 5x lash boosting mascara for sensitive eyes comes beautifully packaged and is approved by opthamologists for contact lens wearers. I really like this mascara and I've had no problems with any smudging plus reviewers online rate it highly with the only negative being that it can be prone to smudging if you get hot and sweaty. But hey who wears mascara when doing sport anyway? I certainly don't. Why does a lot of make-up irritate your eyes and sometimes cause pain if you wear contacts? Synthetic solvents that can cause dry, brittle lashes. Synthetic polymers that can cause lash clumping and build-up on the mascara brush. Synthetic preservatives used to preserve the product on the shelf and at home. Synthetic fibers used to volumize can cause eye irritation. Petroleum by-products that can cause irritation too. 100% free of synthetic solvents and coats lashes without drying them. Contains organic orange water, extracted from orange fruits to hydrate and moisturize. Contains organic aloe and cucumber extracts to calming, soothe and moisturize. 100% Natural biopolymers, derived from nature to provide clump-free lashes. 100% Natural preservatives to reduce the risk of irritation. 100% Natural origin rice protein and organic tapioca starch which naturally boosts volume. 100% Free of petroleum by-products, parabens, GMO's and synthetic fragrances. Now you may not care about the actual ingredients but I like to be green and look after the planet and the animals who share it with me so I do care. And this mascara is kind to my eyes and my contact lenses and as it's such great value for money, I reckon it's the best mascara for sensitive eyes that I have found so far.